Squeese some H&S onto the palm of your hand. Rub it gently onto your hair. Using the tip of your fingers from both hands, massage your scalp until lather forms. Now rinse hair under running water. Fling your head to the left, and then right, as you lift up your head. No. Don't do the jiggle, jiggle towel over hair thing like a mad woman. Put your head to the side and let your hair down. Envelop hair with towel using both hands. Dab, dab. You don't say I don't tell OK? If you are a Growth and Income investor like John Neff, it makes sense to measure your portfolio in Total Returns basis - with breakdown in dividends received and capital gain/loss marked to market. The "right" measurement vehicle should ideally match the corresponding strategy. Measurement or tracking is not as important as what WHAT we intend to DO with the information. Let's say an income investor noticed his dividend income has been declining in the last few quarters - and he has not made any divestments - should he take any corrective actions? Even trickier is when your dividend income has steadily increased over the last 5 years - and you have not made any new investments - but you noticed your income has stagnated and stopped growing for the past 12 months, should you do anything? Now this is next level stuff! If you no clue what you should do in the above 2 scenarios, pray tell why are you tracking your portfolio income in the first place? Land owners, shepherds, and sheep use KPIs for totally different reasons. This is where you may want to quietly delete your goals and milestones if you discover they are written in the language of sheep. Why we hired this person for? Since most people are "investing" on a part-time hobby basis, it could be more important to set goals and write plans when you have an idea what to do when reality deviates from strategy in your day job. You mean you set goals and plans on things you can't control and influence? This is inviting a bulls-eye to be pinned to your back. Men don't listen, see themselves as hammers, and can't wait to be Indian Chiefs! Casual readers may want to skip this post. This is more a "poking" post for the male community members as I'll be making references that you won't know unless you are a regular reader of male financial bloggers. Last night, a new lady colleague from another store came to help us out for a month due to a recent resignation at our store. She noticed I am left-handed and asked if its true that lefties are smarter? 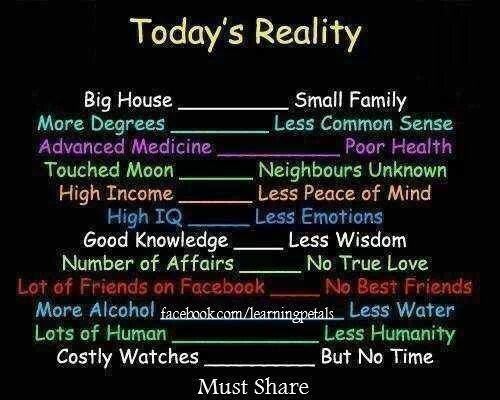 I wished it were true! I told her we lefties are like "women" - we see the world through feelings, emotions, and intuitions. You know, fuzzy, fuzzy, dreamlike, and definitely not in precision terms! OK, that should set the context and perspective. And now the gloves are off! A lady reader made a wonderful insightful guest post at the bleeding heart's blog some weeks back. It's about her creative way to DIY her own "Eldershield" like insurance plan for her parents by monetising the property she is staying in, if and when needed. This is so cool! One thing of note that is glaringly missing from most male finance bloggers - the lady author is using her personal finance knowledge as a vehicle to focus on relationships that matter. And the most silly thing is - when a girl says she knows herself, she meant you can talk to the hand. Talk about dumb and clueless! Guys experienced with women will know this. When your wife or girl friend comes complaining to you how bad her day was, you just (pretend to) listen and don't think too much about it. For you know the next day she will be back to her cheerful self and have forgotten everything! We don't say capricious like the weather for nothing right!? What happens when a male finance blogger does the same "let off steam" thing on-line? I love you! I love you two! I love you three! No, I love you more! Group hug time boys! Oh shut up! You are making me go teary... Boo hoo hoo. And there's this idiot who had delusions of being Joan of Arc... Wants the community to take up arms and tilt at windmills? Eh... Who died and made you Indian Chief? Yes Batman, I'm trolling you! "Song bo"? "You are wind; I am sand. Wherever you go, I'll follow." Trust but Verify - The 3 profiles of "Trust"
But it speaks volumes on how we go about our adult lives. These people could be the "happiest and luckiest" provided they don't fxxx-up the end game by making a decision on their own. It simply means, all through their lives, they have been cloistered by others - parents, marriage partners, big daddy, shepherds, etc. Word association: Childlike, innocent, simple, cute. At the very least, you know what you don't know! It's just that you are clueless on how to verify, where to start, what to do, etc. Word association: Vacillate, prevaricate, equivocate, cavil. We keep an open mind, listen to alternative voices. And we know who and where to seek verification, when needed. We don't go to a shield maker and consult him about the strength of spears. We do that to find out the shortcoming of spears. Wink. And that's through framing the right questions in the first place! Word association: Worldly, street-smart, mature, experienced. 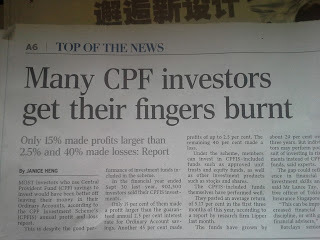 How to put a spin that majority of CPF investors lost money! Wish you had transferred that excess money to SA, didn't you? 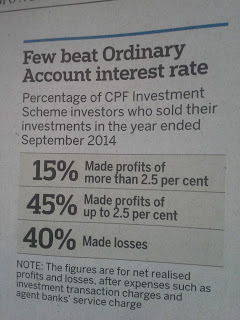 That means only 15% of CPF investors have earned the right to KPKB at Hong Lim Park? 1 May 1986 : Approved Investment Scheme (AIS) introduced. Members are allowed to use up to 40 percent of their CPF savings to buy gold, shares, unit trusts and stocks. 1 Oct 1993 : The Basic Investment Scheme (BIS) and the Enhanced Investment Scheme (EIS) were introduced to replace the Approved Investment Scheme. Members are allowed to set aside a higher portion of their CPF savings (80 percent) for approved investments. 1 Jan 1997 : The Basic Investment Scheme (BIS) and the Enhanced Investment Scheme (EIS) were merged to form the CPF Investment Scheme (CPFIS). For each CPF dollar spent on their HDB or private properties, compare it with their equivalent CPF dollar performance they had "invested" under the various AIS, EIS, CPFIS schemes. The statistical odds are on my side. Wink. 1986 till today, how many years do we need before it's considered "long term" investing? OK, if we want to split hairs, we throw out AIS and EIS. We only consider CPIS. 1997? Isn't that the Asian Financial Crisis? Starting at the low doesn't help after 18 years? We just had a 6 years bull market since March 2009. I would have thought there's more tail wind support!? What happen to the fabled equities will likely "grow" 8% per year mantra? Now its the time to "educate" my clients on how to be nimble! Avoid using words like trading or speculating. Some clients have a Pavlov revulsion to these words. Yes, nimble is a good word. While I'm at it, I'll slip in the art of "shorting". I'll just call it - "Flying with both wings". I'm good or what? Just as long my clients do the nimble dance, the sun will not set on me yet. Not during my watch anyway! Buy term invest the rest? Just as long the Wholelife and Endowment policies I'm touting outperform the CPF 2.5% interest, I'm good to go! I'll avoid ILPs though as they will likely come back to bite me... Repeat business and referrals are my life blood. One time carrot-head chopping deals are more for Sim Lim snake oils... I'll pass. Thank you very much! I must get a hold on the name list of those 85% who under performs the "low" CPF hurdle rate of 2.5% interest!!! Anyone interested to hire a 2nd rate has-been snake oil like me on a freelance consultancy basis? Don't worry. My fees are cheaper than foreign talents (or non talents). Just buy me a drink and I'll sing for you like a canary! Let's sell ice to Eskimos! I rather think in negative sum, thank you very much! Let's start with the easy one - zero sum game. If you have a "friendly" round of poker or mahjong with your friends or colleagues, that's zero sum. That means the money the winners won has to come from the losers. It's my pocket to your pocket that sort of thing. Only feeble brained players believe in this friendly poker advice, "Careful boys, let's play well tonight so we can ALL go home as winners!" Don't laugh. In real life, there are many vested parties who use that poker joke on their non suspecting customers. Often used in the field of properties and equities. Everyone is a winner! Win-win! Another spin is that you are not a "speculator". By owning a fractal share of a company you've invested in, you are a "business owner" (woo....) who profits along with the future growth of the company. Win-win! Mind you, NOL and Creative were once upon a time component stocks in the STI. They are not penny stocks or S-chips. In fact, you can call them "smurf chips". But that was then... Now is now. How's win-win working out for you? In Singapore, I've not lived through a 50% property bear market... Thank goodness! If you interested what it feels like, try talking to friends or colleagues in US or Japan. A plain vanilla 20% property correction we have gone through a few times. Just consult your parents, older siblings, etc. Tip: Always ask, "Will you make me whole again if things do not pan out as you've describe?" Some of you may be wondering why I did not put futures, CFDs, spot forex or options into zero sum? There's exchange fees, GST, brokerage commissions, bid-offer spreads, financing costs, etc. Just look at the financing charges for shorts and longs - the broker even makes on this financing spread! When you win, you win less than what the person who took the opposite side of the trade has lost. It's a bit like protection money. Win must pay; lose also must pay! It's never about being cynical or skeptical. 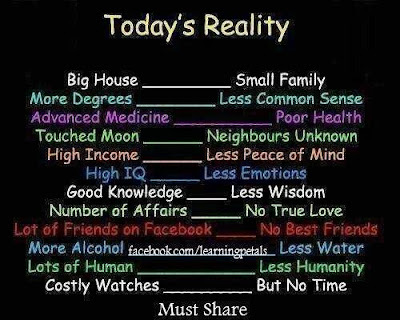 That's too dismal a perspective. It's more about our ability to see through the smoke and mirrors and look out for our own interests. That newsletter from the exchange, that ad from a broker, that blog post from a vested interest who uses social media as a means of reaching out - would they be doing what they do if they don't benefit from this negative sum game? Nothing is for free. OK, maybe with the exception of well meaning advice from bleeding hearts! Negative sum is not scary. Its just a business cost that I'll have to manage - like all other expenses in life. By the way, while you are at it, you might want to add in your broadband subscription, depreciation on computers, investing/trading newsletters, seminars/courses paid for, etc. I don't know... But I recommend you buy! Imagine you are a Hedge Fund Manager and your own buy-side analyst puts forth a buy recommendation report to you. No, you can't fire this analyst; he is your wife's nephew... I know... Relatives from her side of the family... LOL! This sotong buy-side analyst should take a page from his sell-side brethren. Must pretend to have high conviction even though we may have little clue to what we are talking about. If not how to sell snake-oil? Just refer to the Oil and Gas sector sell-side picks like Ezion, Nam Cheong, and Keppel. Any reports from the past 9 months will do. No one foresaw Brent dipping below USD 80 did they? How to downgrade your own high conviction buys from 9 months ago? "In the light of new information...."
"New facts have come into our attention..."
See? Everything is based on facts! Never on guesses or assumptions! That's how you backtrack with a straight face without losing the aura of "professionalism".